An assistant joint surgeon with the National Guard bureau in the Pentagon says she wants to encourage state and local partnerships with the National Guard – to help meet medical and behavioral health needs of military members and veterans. Rear Admiral Joan Hunter says the effort is called the Guard’s Psychological Health Program. She says the National Guard itself doesn’t offer behavioral health treatment – but can partner with local groups to make that treatment available. However, she says the bureaucracy is so big, it is intimidating. North Dakota is reporting 10 human cases of West Nile Virus so far this season. That’s up by two from last week. The Health Department’s Michelle Feist says the latest cases were reported in Burleigh and Dickey Counties. She says so far this has been a low year for West Nile. And Feist says this isn’t a time to let your guard down – because even though there are fewer mosquitoes, they’re still out there. The state Health Department is investigating three e-coli cases in eastern North Dakota. Health Department epidemiologist Michelle Feist says all three people are under 18 – and all attended the Red River Valley Fair in West Fargo. Feist says it appears they had contact with potentially infected animals. An interim Legislative committee will continue a study of behavioral health services in North Dakota. In the previous interim, a consultant issued a report about how North Dakota handles services for mental illness and substance abuse. The Schulte report was the basis for some bills passed in the 2015 Legislature – but advocates say there’s more work to do. "You don't change an infrastructure like behavioral health services in two years," said Rep. Kathy Hogan (D-Fargo), who will chair the interim committee. "This is a very long-term challenge." An official with the state Department of Human Services says one of the big issues the state is facing in behavioral health is tearing down the silos between mental health treatment and substance abuse treatment. Pamela Sagness is the director of the department’s behavioral health division. She says an advisory group is looking at ways to integrate treatment. North Dakota and 12 other states have gone to federal court to stop the EPA and the Corps of Engineers from enforcing the new “Waters of the United States” rule. The suit was filed in federal court in Bismarck. The plaintiffs say the new rule is federal overreach. 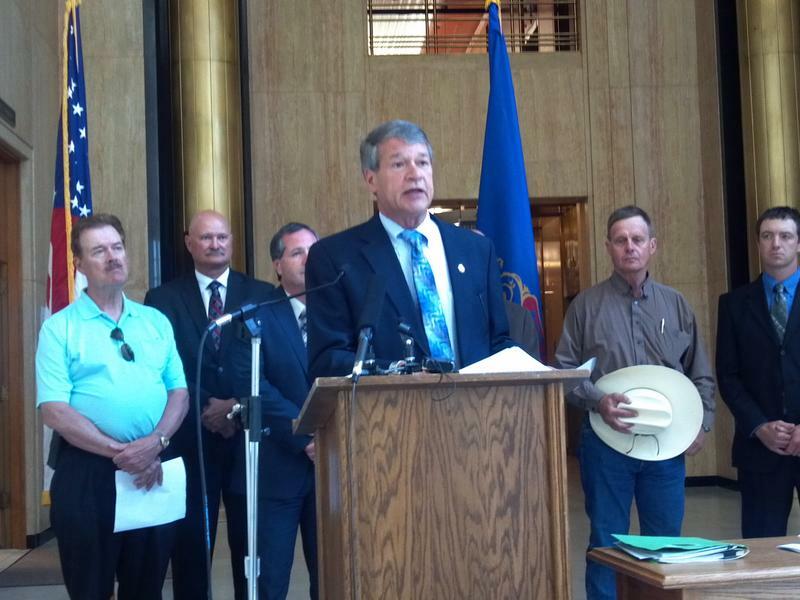 Attorney General Wayne Stenehjem says the EPA’s new rule is unconstitutional. He says it goes far beyond the intent of the Clean Water act. “This federal power grab is unnecessary, unlawful and will do nothing to increase water quality in our state,” Stenehjem said at a Capitol news conference. A group advocating for North Dakota’s interests when it comes to the Missouri River wants to expand the group to be a statewide organization. The North Dakota Missouri River Stakeholders held its spring conference in Bismarck. Organizers say it’s designed to get more than state leaders involved in the issues. ND Game and Fish Dept. / ND Game and Fish Dept. Health officials say North Dakota’s Stroke System of Care is working to increase the chances that someone who suffers a stroke can recover from it. The system was created by the Legislature in the 2009 session. Dr. Ziad Darkhabani is a neurologist with Essentia Health in Fargo – and he chairs the Stroke System of Care Task Force. He says the system allows hospitals to work together to make sure stroke patients get the care they need as quickly as possible. Darkhabani says the system works – very well. The chief engineer of the North Dakota Water Commission is asking the Army Corps of Engineers to move more water out of Lake Sakakawea before the Missouri River freezes up for the winter. "We had way above normal runoff in August," said Todd Sando. "Our tributaries have been putting a lot of water into the Missouri. That's water that needs to be dealt with right now." Sando says his main concern is along the stretch of the Missouri between Garrison Dam and Lake Oahe. He says groundwater could be a problem.